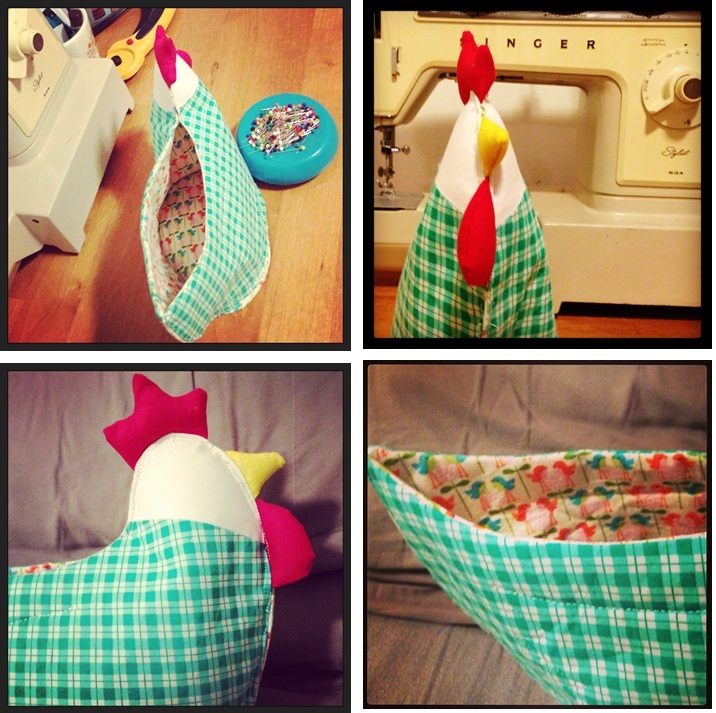 I found an amazing stuffed chicken sewing project on Pinterest but was disappointed when the link stopped working. Other users reported inappropriate content. However, I had no trouble with the link to the blog’s main site (which I typed in manually), and I was able to view older posts until I eventually found the chicken pattern here. Since the website is in Chinese, I thought it would be helpful to provide the English-version tutorial. I am NOT trying to take credit for creating the pattern, just trying to make it available in the English-speaking market. I could not find the link to Sunny’s Lovely Quilt that is listed (via photos) on the Chinese site and on the chicken pattern itself. If someone finds the link and discovers this tutorial already exists in English, please let me know! We don’t want any copyright violations around here! In this spirit, I also did not include photos in this tutorial of anything that already appeared in the original link. Download the pattern on the original website, then follow these instructions. (Note: I re-sized the chicken to fit a printout of 11 x 17” because I wanted it bigger.) All seams are ¼ inch unless otherwise specified. 1. Print the pattern four times. 2. Add a seam allowance. I measured ¼” from each line and did a connect-the-dots thing, but I’ve seen you can also tape two pencils together and draw along the lines (the pencil tips will be approximately ¼ inch apart). On the first printout, draw along the side of the beak, wattles, and comb that connect to the chicken body. Continue by tracing along the rest of the pieces. You can also draw along the entire chicken bottom on this printout. 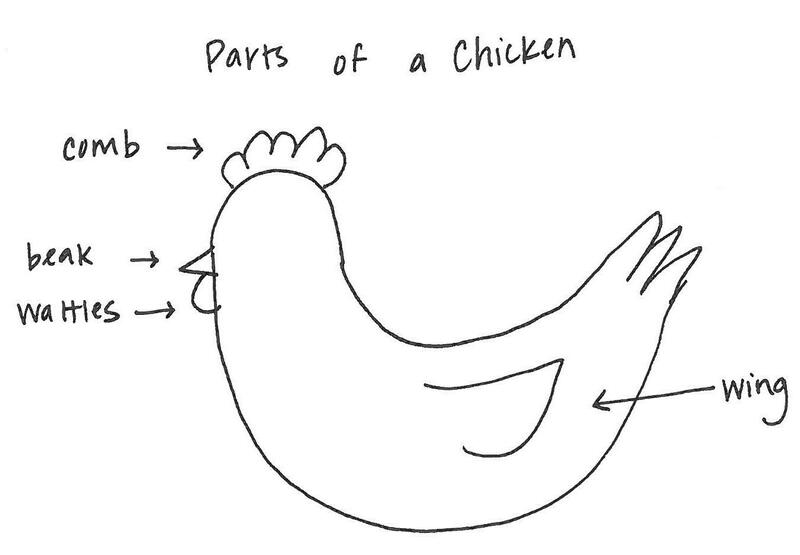 On the second printout, draw along the side of the chicken head that connects with the body. Continue around the rest of the chicken head. On the third printout, draw along all edges of the chicken body (excluding the connecting pieces you have already traced). On this page, I also traced around the beak. There was slight overlap, but I traced the small beak onto another piece of paper rather than printing a fifth chicken. On the final printout, trace along the entire chicken body including the head but excluding all other pieces. 2. Cut out all the pieces. This is your final pattern. On the body (lining) pieces, trace the wing outline using the water- or air-soluble ink of your choice. Do the same for the X shape on the bottom lining piece. A photo of the pieces you should have appears on the original website. 6. Sew one head piece to the corresponding body piece (outside piece). Repeat for opposite side of chicken. 7. Layer one body piece with head added (outside) and corresponding lining piece right sides together. Sew along the edges, leaving about 2” along the bottom unsewn so you can flip the chicken right-side-out. After flipping, insert the felt lining and sew the 2” hole closed. Repeat for opposite side of chicken. 9. Repeat steps 7-8 for the bottom piece, layering the outside and lining pieces, sewing all but 2 “, flipping right-side-out, inserting felt, closing the hole, and quilting the X. 10. With the two remaining head pieces, sew along outside (leaving a hole), stuff, and close hole. This will be called the “head stuffer” in step 13. 11. Pin comb, beak, and wattle to the lining side of one quilted body piece. Sew using slightly less than a ¼” seam (so the stitching won’t show when you sew the two body pieces together). This is pictured on the original site. 12. Place outside sides of body together. Sew from the tip of the tail to the bottom of the chicken, but not along bottom. Sew from the back of the head, over the top of the head, to the bottom of the chicken. Do not sew the back or bottom of the chicken! All seams in this step should be as close to the edge as possible. 13. Put the “head stuffer” into the chicken head and place one eye on either side of the chicken. Using a tapestry or other long needle, connect the eyes through the head stuffer to keep it in place. 14. Pin the bottom piece to the chicken and sew around it. Because I am still pretty new to curved lines, mine didn’t turn out perfectly, and I can’t tell whether it’s a pattern issue or a sewing issue. (My oval for the bottom was too big.) I suggest checking the size of your oval before sewing to the chicken. Still, it’s pretty cute – and it’s lined with leftover bird fabric from a baby quilt I made. The chicken was originally intended to hold eggs, according to the earliest pinner on Pinterest, but I will use it to hold chicken bean bags from this tutorial. The goal is to play this game or this game at the park with my cousin and her kids when they visit later this spring. If you have questions, please leave a comment. Thanks for stopping by! Categories: Crafts & Projects, Other Sewing, Tutorials | Tags: batting, bean bag, bean bag games, beanbag, bird, chicken bean bags, child, children, Chinese, circle, city, egg holder, fabric, felt, hen, interfacing, kid, kids, outdoors, oval, park, pattern, pinterest, project, quilting, sew, sewing, stuffed chicken, stuffed hen, Sunny Lovely Quilt, tutorial, wing | Permalink. I feel like I have been all over the world trying to find the paper pattern template for the Stuffed Chicken. Is it possible to get it from you? Unfortunately, since it’s not my pattern, I want to avoid violating any copyright laws and therefore don’t feel comfortable sending the pattern to people. You can get a copy from the website linked above, though: http://blog.sina.com.cn/s/blog_5ec49a800100zlqf.html. You just resize as you deem appropriate. Good luck! Thank you! I’ve been looking all over for a chicken. 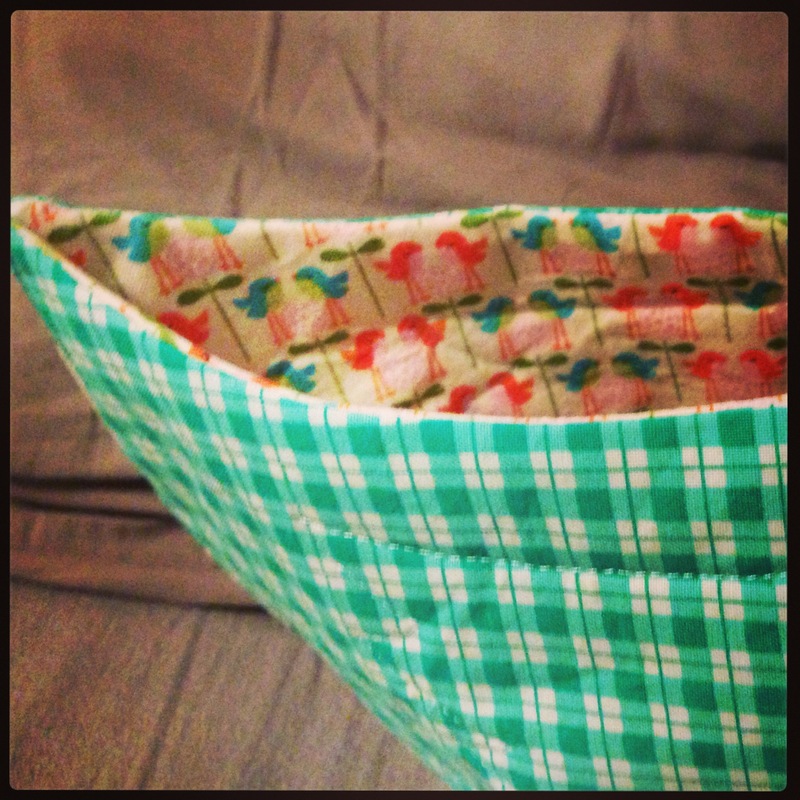 Sewing pattern to hold eggs. I remember a vintage gingham chicken pattern in the 1960s and wanted to sew one like it. I am thrilled to see the project is still useful! I have my chicken filled with clothespins currently and love that it’s more fun to look at than a box. Hi! I'm Tiffany. I like quilting best but sometimes dabble in other projects. La Passacaglia: Big 4 Complete! 1930s Farmer’s Wife Quilt-A-Long: 5 Blocks Complete! Botanics Plus Quilt: A King-Sized Success! Sew Kitschy – A Placemat Finish!